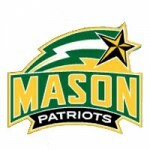 Behind four players each with 13 points, the George Mason men’s basketball team opened Atlantic 10 Conference play with a 70-62 victory over La Salle Saturday night in the Patriot Center. No. 18 Oklahoma snapped George Mason’s two-game winning streak on New Year’s Eve, defeating the Patriots 61-43 in the Lloyd Noble Center to remain perfect on its home court. The George Mason men’s basketball team handed Wright State its first home loss of the season and snapped a four-game win streak for the Raiders, defeating WSU 68-60 Tuesday night in the Nutter Center. The George Mason men’s basketball team picked up its second straight win Saturday night defeating Iona, 86-81, in the Patriot Center. Junior Shevon Thompson notched his third double-double of the season leading the George Mason men’s basketball team to a 99-69 rout over Catawba in the RAC Wednesday night. Sophomore Marquise Moore sank a pair of free throws with two seconds left in regulation to force overtime at Northern Iowa, but George Mason couldn’t overcome UNI as the Patriots fell in overtime, 71-65. Junior guard Patrick Holloway scored eight points in the final 35 seconds to cut George Mason’s double-digit deficit, but it was not enough to rally back as Cornell topped Mason men’s basketball 68-60.